Any information provide to us in the form of emails, phone conversations, and other electronic forms, FAX, or mailed documents, are held in confidence and not shared with outside sources. We do collect certain information about website usage and other types of general information that would be included in all website log files. We do not share this information with outside sources. Professional Web Services collects statistics about the behavior of visitors to our website(s). For instance, we incorporate analytics software on our websites (including blogs) used to provide ongoing web analysis for website quality improvements. Professional Web Services does not disclose personally-identifying information other than as described below. Professional Web Services will not rent or sell potentially personally-identifying and personally-identifying information to anyone, other than to its employees or contractors. Professional Web Services discloses potentially personally-identifying and personally-identifying information only when required to do so by law, or when Professional Web Services believes in good faith that disclosure is reasonably necessary to protect the property or rights of Professional Web Services’ third parties or the public at large. If you have supplied your email address, Professional Web Services may occasionally send you an email to tell you about new features, solicit your feedback, or just keep you up to date with what’s going on with Professional Web Services, and our products and services. We occasionally use our various websites and blogs to communicate general sales, marketing, and advertising information related to ongoing business activities, so we expect to keep email notifications to a minimum. Professional Web Services takes all measures reasonably necessary to protect against the unauthorized access, use, alteration or destruction of potentially personally-identifying and personally-identifying information. Professional Web Services maintains high ethical business standards and practices. Because of our close working relationship with our clients, including detailed information that is gathered about a company and/or their clients, for properly marketing and advertising our client’s B2B or B2C business organization on the Internet, and any information related to proper web development and website design, we consider a relationship with a client personal, private, and remains confidential. As such, we will not disclose that information to others. Information is collected for internal statistical purposes only and is not used to identify individuals. The information collected helps us to evaluate our site and aid in ongoing website improvements. We also use third-party advertising companies to serve ads when you visit our various websites. These companies may use information (not including your name, address, email address, or telephone number) about your visits to this and other websites in order to provide advertisements about goods and services of interest to you. If you would like more information about this practice and to know your choices about not having this information used by these companies, click here. If you would like further information regarding online privacy or the implementation of website analytics for your B2B or B2C website feel free to email us today. 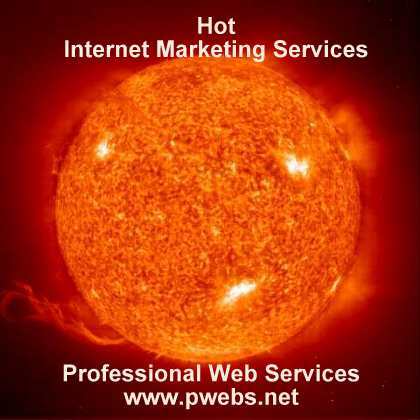 Ask us for a free Internet marketing services evaluation and quote. Remember, when working with clients, he or she is placing web site trust in you. Hold onto that trust dearly and don’t do anything that would harm it. They are trusting you to help them out on the Internet. Remember this saying: Tell it like it is and do it with style! Customers will appreciate it. We provide a great Internet business solution for companies looking to get their website found online. Contact Professional Web Services today about Internet marketing services, ethical search engine optimization “SEO,” online advertising strategies and campaign management, and Web branding solutions for building up your marketing message online. Professional Web Services standouts from the crowd. You can trust that we will always have the best interest of our customers first.